Files to have on hand: Root and Intermediates. These can be obtained from us through your account. If you don't have access to them you may download them from the Root & Intermediate Certificates section of our Downloads area. If you're unsure which to get or which is which, please visit: Which is Root? Which is Intermediate? Start -> Run -> Type "mmc" (without quotes) and Click 'OK' or hit Enter on your keyboard. 6. Close the 'Add Standalone Snap-in' window and click 'OK' in the 'Add/Remove Snap-in' Window. 7. Will now be returned to the MMC. 1. 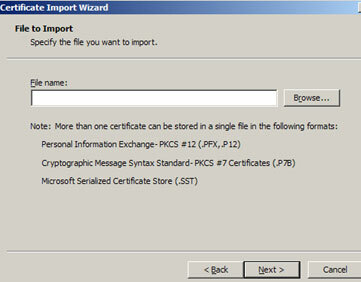 Expand the Certificates section by clicking on the plus (+) sign and turn it to a minus (-) sign to expose the 'Certificates' tree. 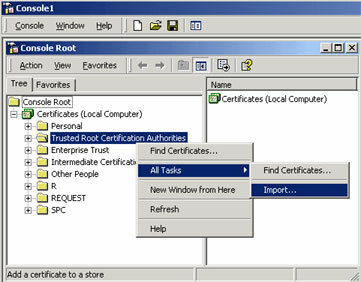 Right-click on 'Trusted Root Certification Authorities', select 'All Tasks', then select 'Import'. 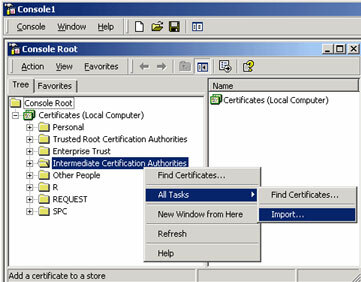 The process is the exact same except the area of interest is 'Intermediate Certification Authorities' instead of 'Trust Root Certificate Authorities' and the file(s) that are to be imported are the remaining files outside of your domain certificate. 4. 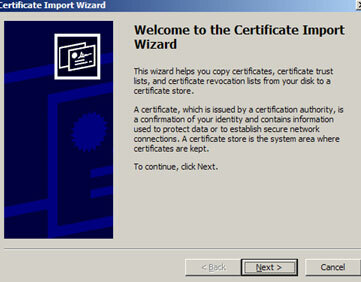 Restart Website through IIS. Note: If you're page is still showing certificate errors, one may have to stop and start the website or even the IIS Service itself. If this fails one may have to restart the server itself. Do keep in mind that rebooting the server is to be used as a last resort. Please contact support if you require further assistance.